In my first journal entry I talked about my background and how I acquired my 1937 Buick. If you haven't already read that entry I can bring you up to speed by telling you that after fabricating and installing a new wire harness I was able to get my car to run, but only while my father continuously dripped fuel down the carburetor's throat. Clearly I was having fuel flow issues and with a car that sat for well over a decade this was no surprise to me at all. The 1937 Buick Special's fuel line starts at the tank under the trunk, runs along the passenger side frame rail to the engine compartment where the fuel pump sits on the lower front portion of the engine on the passenger side. From there the fuel is pumped up to the top of the engine, crosses near the radiator and then travels back another foot to the carburetor. In my first attempts to start the engine I had already drained the old gas from the tank and replaced it with new fuel blended with aviation gas. I was getting fuel to my fuel pump's sediment bowl but nothing beyond that point. There are a few reasons why I chose to add aviation gas (100LL) to my fuel tank. As a private pilot I have very easy access to it but first and foremost is the fact that aviation gas contains no ethanol and, when properly stored, can last years with no loss of octane. You read that right, YEARS not months like modern gasoline. Aviation gas won't "gum up" either and as an added bonus it smells great! As the name 100LL suggests, Avgas has an octane rating off 100 and LL represents "low-lead". Automobile fuels in the late 1930s were leaded blends so I figured the lead additive would be a nice treat for the old engine. From a performance perspective Buick's 1937 Series 40 engine only has a compression ration of 5.70:1 so the high octane Avgas was not looked upon to boost performance! After sitting for over a decade I (correctly) assumed that the fuel pump diaphragm had simply deteriorated and cracked. 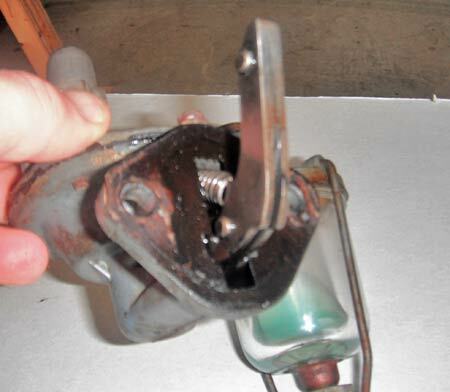 This would prevent the pump from creating any suction and it would also allow gasoline to enter the crankcase. When I changed the oil earlier in the project I remembered a strong fuel smell in the old oil â€“ this SHOULD have been a big red flag for me but I lacked the experience at the time to give it much of a thought. Faced with a fuel pump rebuild I decided to take a step back from my excitement and approach the car with a little more patience. I knew that now was the time to drop and clean the oil pan, pull the overhead valve cover to clean the rocker arm shaft, rocker arms and springs, and check for any major sludge buildup or blockages. Pulling the oil pan is not a difficult procedure at all. Without a lift, however, it does require a little neck straining. The first step (after draining all the oil of course) in this procedure is removing the front stabilizer bar. This bar limits the amount of leaning the passenger cab experiences when rounding curves. It's a nice feature, but it sits just below the front 1/3 of the oil pan. If you don't pull the stabilizer bar the oil pan cannot be dropped low enough to clear the oil pump's floating pickup inside the crankcase. The stabilizer runs just under the oil pan. With the stabilizer out of the way it is just a matter of removing the nearly three dozen bolts that hold the pan to the case. Once those are out a few gentle taps with a mallet will loosen the pan. My pan had about 1/2" of sludge on the bottom. I have no idea how long it takes for 1/2" of sludge to form but I am guessing things sat around for a while. After scraping, cleaning and stripping the pan it was time to paint it. I used PPG Delfleet Essential epoxy primer followed by Bill Hirsch Engine Enamel. 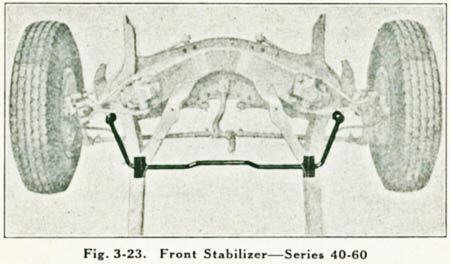 The Hirsh product instructions state that no primer is needed on cast iron parts but some sort of primer is needed on steel. The engine paint sprayed thicker than I was used to but in the end the pan turned out rather nicely. After waiting a couple weeks for the paint to fully cure I reinstalled the pan and then the front stabilizer. Reinstalling the pan was a bit harder than removal because my cork gasket didn't want to cooperate as I tried to get bolts started with a very limited amount of room underneath the car. I ended up using a few strategic dabs of Permatex Aviation Form-A-Gasket to hold the gasket in place while I started the bolts. Shifting my focus under the valve cover revealed more sludge. 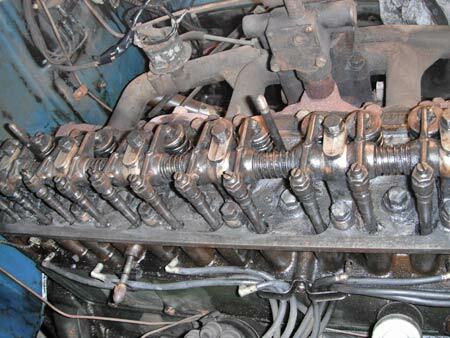 The '37 Buick lubrication system first hits the lower part of the engine before oil is pumped up to the rocker arm shaft and ultimately drips back down to the oil pan. This final stop in the oil system is a great place for dust and dirt to settle forming that wonderful sludge. 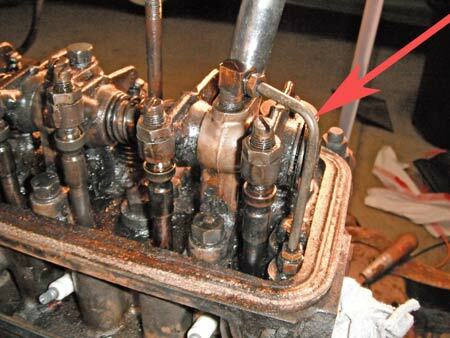 Critical to oiling the top part of the engine is a small pipe that connects the crank case oil shaft to the rocker arm shaft. If this is blocked in any way you would have limited oil flow to your rocker arms so it was absolutely essential that I took the time to clean this. First look at the sludge under the valve cover. 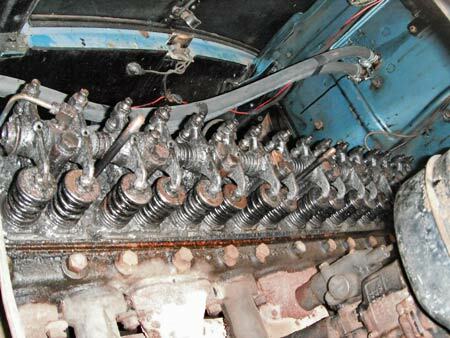 It is absolutely critical that this small pipe between the case & rocker arm shaft is free from obstruction. Blockages could lead to catastrophic damage. It took a lot of rags and patience to clean the rocker arms, shaft and chamber itself but it eventually was free of all the major sludge. When the engine was sealed back up I refilled it with non-detergent oil even though I went through some pretty good efforts to clean up all the sludge. The theory goes that on old cars you should always use non-detergent oil so it doesn't loosen anything up and cause blockages somewhere in the lubrication system. It makes sense in theory but to be honest, I've never talked with or even heard of someone who did use detergent oil that caused a blockage resulting in a damaged engine! Nevertheless, I played it safe and went with non-detergent—I don't want to be "that guy". 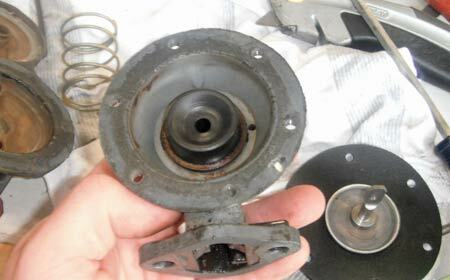 Getting back to my fuel pump, the '37 Buick Special uses an A.C. type "W" unit. It is a single action pump so its only responsibility is to pump fuel. The mechanics of the pump are really quite simple. A little foot from the fuel pump makes contact with the camshaft. In this area the camshaft has a small lobe, or eccentric, that forces the pump's foot to move when the engine is turning. The foot is connected to a link that pulls the diaphragm down creating a vacuum in the pump chamber. At rapid speed this pump can create up to 3-1/2 pounds of fuel pressure. 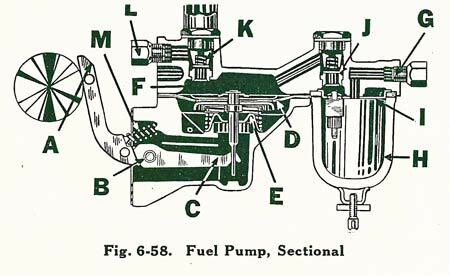 Diagram of fuel pump from '37 Buick Shop Manual. Fuel pump freshly pulled from engine. For the most part, rebuilding a fuel pump is very easy. The rebuild kit comes with a new diaphragm, return springs, sediment bowl screens and of course gaskets. It is just a matter of swapping new for old and cleaning things as best as possible. 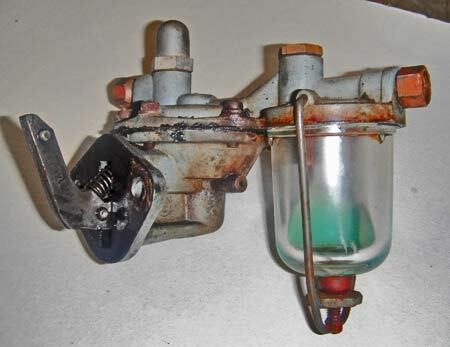 While it is a relatively easy project, there are two very important aspects to a fuel pump rebuild. First, you have to be certain that the two mating parts of the pump chamber are perfectly flat. If they aren't you will either have no suction or experience a leak. If your parts aren't flat you can simply lay some sandpaper on a flat surface and then carefully sand the piece against the flat sandpaper. My table saw's bed worked perfectly for this step. Second, you will need to "preload" your new diaphragm. 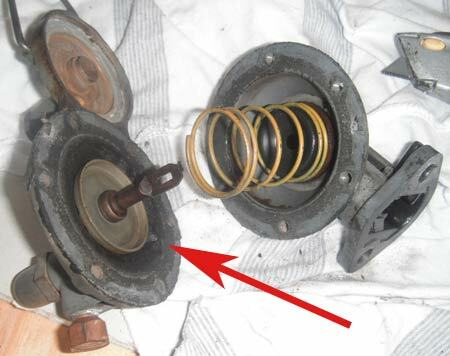 To preload your diaphragm simply place the fuel pump foot in a vice and twist the entire unit so that the diaphragm is pulled down as far as it will go. In this position you simply attach the top then remove the unit from the vice. You may need an extra set of hands for this step. If you don't preload your diaphragm and just leave it relaxed the diaphragm will tend to get stretched around the screw holes while in service. This will lead to a leakage and ultimately unit failure. During my fuel pump rebuild the hardest part was getting the connecting link between the foot and the diaphragms eye. I only had to swear a few times before it fell into position. The guts of the fuel pump are exposed. Arrow shows hole in diaphragm. Lower bowl in hand, new diaphragm on table. With a new fuel pump and sludge free lubrication system I was finally ready to start my car on its own. I started cranking as my dad watched the fuel pump sediment bowl. After a few seconds of cranking I got word that the fuel was flowing. I waited a few more seconds and she finally caught and stayed running! It was great to hear the "Old Girl" roar back to life. I had great oil pressure and the engine sounded smooth. The pride I felt after getting the Buick running after it sat dormant for so long was incredible. After a few more tests I was ready to drive it around my property while enjoying an ice cold root beer.